T he current study is performed to investigate Cu status, content, distribution and speciation in the newly reclaimed soils of the 10th of Ramadan region. 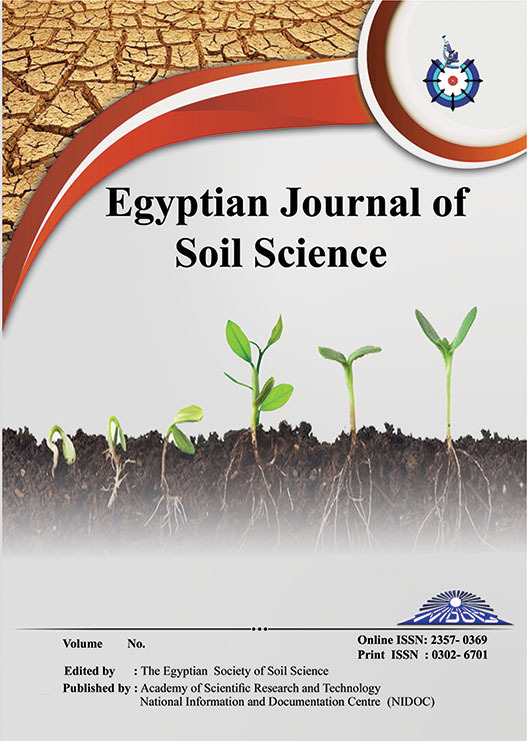 To achieve this objective, the physico-chemical and mineralogical soil characteristics were first identified to shed light on the major soil properties that may control Cu behavior in the concerned soils. Eight soil profiles were selected to represent the soil mapping units and the variations encountered in these soils with respect to texture, CaCO3, OM, soil reaction, soil salinity and its components. Besides, surface area and adsorption desorption areas on the soil surface and their relations to clay minerals and accessory minerals constitution which displayed certain differences that reflected on the different Cu forms. Noteworthy that none of Cu-bearing minerals has been detected. The obtained results reveal that total Cu, DTPA - extractable Cu and speciation (forms) of Cu vary widely within and between the examined soil profiles. For convenience, total and DTPA – extractable Cu range from 4.88 to 19.19 mg/kg and 1.56 to 4.51 mg/kg, respectively. The total and extractable Cu as well as the speciation forms of Cu were interpreted and their distribution in relation to soil variables and interrelations between Cu forms were statistically evaluated. Sequential extraction indicates that the residual Cu which is the inert fraction is the major abundant form, while, Fe-Mn form is the second important form. Those forms constitute 44.43 to 76.50 % and 14.75 to 32.76 % of total Cu. Other labile fractions, i.e. soluble Cu, exchangeable Cu, carbonate bound Cu and organic–bound forms constitute 2.35 to 4.02 %, 1.71 to 4.09 %, 1.54 to 4.84 % and, 0.45 to 2.73 % of total Cu, respectively. Consequently, the study provides useful information about soil Cu mobility and bioavailability as essential micronutrient to plants, and food- chain of animals and human beings. The contribution of Cu to soil pollution and contamination is also considered through computation of enrichment factor and single pollution index.